The Strum Public Library is governed by the Library Board of Trustees. The Board of Trustees meets bi-monthly and is the decision-making board for the library. Strum Library History The Strum Public Library has a history that predates the incorporation of the Village itself. The first library in Strum, which was then only an unincorporated part of the Town of Unity, was started by Chet Peterson, the chairman of the Town of Unity in the late 1920s. Chet and other volunteers waged a door to door campaign to collect donations of books that could be used to start the new library. Since no funds were available for the library from tax collections at that time the library was entirely dependent on donations. Books at that time were extremely expensive and considered a luxury item, so collecting donations of books must have been very difficult. At some point the Wisconsin Traveling Library Association loaned books to Strum, also. The first location of the library was the Temperance Hall on Elm Street and later the T.M. Olson Building. Librarians at that time were volunteers and included the talents of Jennie Bergerson, among others. 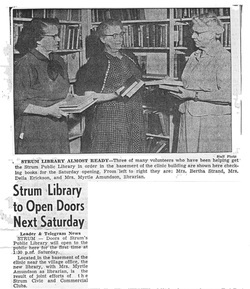 On March 3, 1956, due to the dedication and hard work of the Strum Civic Club, the Strum Commercial Club and the Village of Strum, the Strum Public Library opened its doors. The library was located in the basement of the clinic building on 5th Avenue and its shelves held a total of 2,300 books, all of which had been donated. The library at that time was able to start up with a budget that totaled $650.00 that had been raised and donated by the Civic Club, Commercial Club, and the Village of Strum. The startup money covered the cost of a new set of encyclopedias, shelves, and a $25.00 per month payroll for a librarian. Myrtle Amundson was the librarian there from 1956 to 1964. Astrid Hanson followed from 1964 to 1972. In 1965 the current Strum Civic Center was built to house the village clerk, police department, fire department, library and community hall. Librarians since included Ethal Hagen from 1972 to 1985 and Kathy Wezyk from 1985 to 2007. In 2006 the Strum Public Library moved to its current home at 114 5th Avenue in Strum. The library director is Dawn Hering. For more information about the current facility please visit the "Our Facility" section of the website.